Popular protests are rumbling across Sudan, shaking President Omar al-Bashir's 30-year grip on power. The authorities have cracked down hard and, as the demonstrations intensify, they may ratchet up the repression. External powers should urge restraint and offer Bashir a way to the exit. What's new? Protests across Sudan flared up as the government cut a vital bread subsidy. Economic grievances are fuelling demands for political change, with protesters calling on President Omar al-Bashir, in power since 1989, to resign. Authorities have responded with violence, killing dozens and arresting many more. Why does it matter? In the past, President Bashir and his government have been able to ride out popular demonstrations. But these newest protests, demanding Bashir resign because of economic mismanagement and corruption, have spread to loyalist regions and coincide with rising discontent in his party. What should be done? Foreign governments influential in Khartoum should continue to publicly discourage violence against demonstrators, with Western powers signalling that future aid and, in the U.S.'s case, sanctions relief are at stake. They should seek to improve prospects for a peaceful transition by creating incentives for Bashir to step down. Protests engulfing Sudanese towns and cities have seen dozens killed in crackdowns by security forces and could turn bloodier still. Demonstrators express fury over subsidy cuts and call for President Omar al-Bashir to resign. Discontent within the ruling party, the depth of the economic crisis and the diverse makeup of protests suggest Bashir has less room to manoeuvre than before. He may survive, though likely by suppressing protests with levels of violence that would reverse his recent rapprochement with Western powers and deepen Sudan's economic woes. Another scenario would entail his ouster by parts of the security apparatus, though this could also prove destabilising. Better would be for Bashir to negotiate his exit, perhaps induced by some form of conditional immunity. Outside powers should keep discouraging crackdowns, with Western leaders underscoring that continuing to use violence against protestors will scuttle aid and sanctions relief. They should also create incentives for Bashir to resign and signal to Sudanese elites the economic lifeline on offer were that to happen. President Bashir has weathered many such protests in the past, but a number of factors this time around are different. Protesters have gathered in Bashir's strongholds, mostly in the wealthier centre of the country, and attacked several ruling party offices. The police and other security agencies, including the National Intelligence and Security Services (NISS), have at times responded brutally but the army has shown greater restraint than before and, noting this, the opposition has urged generals to remove Bashir. The feared Rapid Support Forces, a government militia renowned for its brutal counterinsurgency tactics, has been active, particularly in Khartoum, but less prominent than during previous protests, when they were responsible for many deaths. Within the ruling party and security elites, ever-louder voices question whether the country can escape its economic doldrums with Bashir at the helm, given that his presidency is the greatest obstacle to obtaining foreign aid or loans. Three scenarios appear possible. One is that the president survives, though without funds to offer protesters significant reforms, he will likely have to subdue them by force. This in turn would slow Western re-engagement with Khartoum and almost certainly end prospects of the U.S. lifting its remaining sanctions, including its designation of Sudan as a state sponsor of terrorism, which in effect bars Sudan from international debt relief or bailouts. A second scenario could see protests gathering pace and prompting the president's ouster by elements within his party or security elites. This might usher in a new government and fresh direction, though it could also trigger further instability. To insulate against coups, Bashir has regularly shuffled security chiefs, marginalised rivals and kept the security forces factionalised. A takeover by another senior figure could prompt infighting among divided security factions. A third scenario would see Bashir resign. This would allow for a leadership change that could mollify protesters. Many see Bashir as emblematic of an unaccountable and self-interested elite that has led the country into long-term economic crisis, isolated Sudan and stubbornly refused to implement substantial reforms to resolve these problems. Some of Bashir's allies and former senior officials are encouraging him to step down in 2020; the president pledging not to contest the 2020 vote would be positive, though this carries a risk that he later reneges. For now, he shows few signs of stepping down. Indeed, the president has strong incentives not to do so, fearing the next government would hold him accountable for corruption at home or, if he leaves Sudan, delivery to the International Criminal Court, which has indicted him for atrocities in Darfur. For outside powers, the first priority should be to minimise bloodshed on the streets. Foreign governments with sway in Khartoum should publicly discourage violence against demonstrators and call on the government to maintain forces, especially the Rapid Support Forces, in check. Western powers should continue to signal that future cooperation, aid and, in the U.S.'s case, normalisation of ties, are at stake. They should warn commanders of the various security forces that they could face travel bans, asset seizures and prosecution abroad for indiscriminate violence against demonstrators. More broadly, those governments should seek to improve prospects for a peaceful transition; doing so is as critical as taking immediate steps to deter violence. Behind the scenes, they should press the president to step down or at least pledge not to seek re-election in 2020. They might also signal to Sudanese political and security elites that greater aid and investment would likely be forthcoming without Bashir. The UN Security Council might also offer to request the ICC defer investigation or prosecution of Bashir's case for one year, pursuant to the Rome Statute's Article 16, were he to resign or to leave office in 2020; the deferral could be extended provided Bashir stayed out of - and did not interfere in any way with - Sudanese politics. The downsides to deferring his case would be enormous, but without a pledge along these lines, Bashir is unlikely to step down. 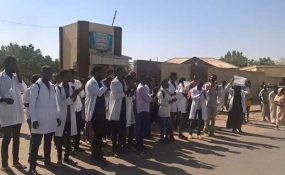 Protests broke out on 19 December in Atbara, a town about 350km from the capital Khartoum and the historic home of Sudan's once-powerful national labour movement. [fn]For past Crisis Group work on the implications of Sudan's long-term economic crisis and the prospects of full re-engagement with Western powers, see, Crisis Group Africa Reports N°194, Sudan: Major Reform or More War, 29 November 2012; N°174, Divisions in Sudan's Ruling Party and the Threat to the Country's Future Stability, 4 May 2011 and Crisis Group Africa Briefing N°128, A New Roadmap to Make U.S. Sudan Sanctions Relief Work, 29 September 2017. Sudan's national labour movement was historically influential, playing a lead role in the agitation for the end of Anglo-Egyptian rule and demands for expansion of political space after independence. Bashir banned independent unions and imprisoned leading figures in the labour movement after taking power in 1989 but unions are still allowed to organise by sector and an alliance of professional unions is spearheading this latest wave of protests. See, "Protesters call on Sudan's President Bashir to step down", BBC, 4 January 2019.Hide Footnote Unusually, protests are taking place in riverine areas, which are close to Sudan's wealthier centre and traditionally loyal to Bashir, making them all the more threatening to his rule. [fn]Crisis Group interviews, academics, security figures and National Congress Party (NCP) officials, Khartoum, December 2018-January 2019. Unlike in 2013, the protests do not mainly include just opposition supporters. Some affiliates of the ruling party have broken with the government and backed the demonstrators; the response of many senior officials to calls for change has been muted. One NCP official said it was significant that senior officials apart from Bashir have come out to condemn the protesters or to defend the government. He said this uncertainty about events but also a general frustration with Bashir's administration, including among ruling party supporters unhappy with the economy and wanting a change of direction.Hide Footnote Protesters have attacked offices of the ruling National Congress Party (NCP) in a number of towns, ransacking and sometimes burning the buildings; rarely in the past have such attacks occurred outside Darfur or Sudan's other conflict zones. Protesters come from mixed political and economic backgrounds. They include members of Sudan's longstanding leftist movements, the Sudanese Communist Party and the Sudanese Congress Party (whose members are particularly active on social media) and a number of other political parties, along with professional trade unions, notably doctors, who are currently on strike. [fn]Sudan's opposition parties have joined protesters in urging Bashir to step down. A number of smaller parties affiliated with the NCP also on 1 January asked Bashir to leave power and form a government of technocrats to resolve the crisis. Protesters on the streets, however, have been keen to emphasise their non-affiliation with any of the mainstream political parties.Hide Footnote The newly-formed Sudanese Professionals Association - an umbrella group encompassing several professional unions - organised a march on the presidential palace on 25 December and again on 31 December demanding Bashir's resignation. The association is coordinating with Girifna, a loose coalition of youth movements formed by anti-regime university students in 2009 to agitate for reform in Sudan and a change in the country's leadership. [fn]Girifna means "We are fed up" in Arabic.Hide Footnote The bulk of the protesters, however, are ordinary Sudanese with no strong political affiliation and who blame their dire economic plight on the NCP's economic mismanagement and kleptocracy. Bashir has labelled the protesters "vandals and looters" and in a speech, delivered in the NCP's stronghold of Gezira state, just south of Khartoum, describing them as "traitors, mercenaries, agents and heretics". [fn]"Sudan's Omar al-Bashir: 'Our duty is to stop looting'", Al Jazeera, 31 December 2018; "Sudan's protests points to weaknesses in Bashir's rule", Associated Press, 27 December 2018.Hide Footnote But at the same time, he has urged the police not to use "excessive force". [fn]"Sudan's Bashir tells police to rein in force against protesters", Daily Nation, 31 December 2018. In 2013, Bashir opted for a violent response, sending militias out to the streets to shoot into crowds. He did not issue statements acknowledging the legitimacy of protesters' grievances as he has in 2018.Hide Footnote Reportedly, some senior security officials have counselled against using indiscriminate violence, fearing this could provoke a larger public backlash and weaken the government's relationship with Western countries, who have already condemned the violence. [fn]Crisis Group telephone interview, Sudanese academic, December 2018. The head of the intelligence service, Salah Gosh, is said to be coordinating the regime's response to the protests and he has reportedly advised against a harsh crackdown. President Bashir's government has weathered protests and contended with economic discontent in the past. But entering 2019, it has fewer options for generating the revenue necessary to assuage protesters. It has faced a severe economic crisis since the start of 2018, consistently refused to cut exorbitant state spending in the security sector and lost potential investment due to sanctions, international isolation and a failure to develop an attractive environment for investors. The country's already-high levels of debt mean that it will be difficult to borrow funds to finance its deficits, and its chief financial backers in the Gulf are less generous than in the past. Sudan's economic crisis originates in part from South Sudan's secession in 2011, which led to the loss of nearly three quarters of Sudan's oil reserves. Previously, oil production generated around half of all tax revenues and two thirds of Sudan's foreign exchange earnings. [fn]Sudan: 2013 Article IV Consultation", IMF Country Report No. 13/317, October 2013, p. 4.Hide Footnote The secession agreement sought to cushion the impact of South Sudan's independence through a series of lump-sum payments from the now oil-rich Juba to Khartoum amounting to some $3 billion. Furthermore, Sudan's $55 billion in external debt prevents the government from accessing new foreign credit, except ad hoc loans mostly from Gulf allies. Sudan would normally be eligible for debt relief under the joint International Monetary Fund (IMF)-World Bank Heavily Indebted Poor Country Initiative (HIPC), but cannot gain that while it remains on the U.S.'s list of state sponsors of terrorism. [fn]For countries on the U.S. state sponsors of terrorism list (SSTL), sanctions are applied under four main categories: restrictions on U.S. foreign assistance, a ban on defence exports and sales, certain controls over exports of dual use items, and miscellaneous financial and other restrictions. The government did not do so. Moreover, because its efforts to reduce spending focused on eliminating subsidies rather than downsizing the military budget or recovering revenues lost to corruption, they hit the poor hardest. [fn]According to the government, spending on security and defence was 23.9 per cent of total expenditures. "Projected General Budget Expenditure of the National Government for the Year 2018 on the Basis of Sectors", Government of the Republic of Sudan, December 2017, p. 80. Already in January and February 2018, the combined effects of the subsidy cuts and the currency devaluation stimulated a number of well-coordinated protests. Many demonstrators were committed anti-government activists and some were linked to established opposition political parties; the protests failed to attract the broader social base that has taken to the streets today and were not large enough to threaten Bashir. Still, security forces arrested over a hundred protesters and held them without charge for weeks. [fn]Dozens arrested in Sudan as protests over price hikes continue", Sudan Tribune, 17 January 2018; Crisis Group interview, Sudanese opposition activist detained by government January - April 2018, phone, April 2018.Hide Footnote Newspapers that covered the events had entire print runs confiscated and some journalists were temporarily detained. The harsh measures the government used illustrated its nervousness about potential public anger at the economic downturn. While Sudan's relations with Western powers, particularly the U.S. and European Union, have improved, they have yet to pay economic dividends. Over the past few years, Khartoum has skilfully used its advantages as a partner on counter-terrorism (particularly regarding jihadist groups in neighbouring Libya), its influential role in South Sudan and its cooperation with the EU on migration management to slowly build better relations with Western countries. In October 2017, the U.S. lifted some economic sanctions, which had been in place since the late 1990s. As yet, however, this has not had a notable effect. Khartoum remains deeply in debt and considered a risky investment destination. The second phase of U.S. sanctions relief, the program for which was announced in November 2018 - requiring Khartoum to make improvements in six areas, including in its respect for human rights - should be more significant, potentially leading to Sudan's eventual removal from the U.S.'s state sponsors of terrorism list. In recent years, Khartoum has relied heavily on assistance from Gulf partners, particularly Saudi Arabia, the United Arab Emirates (UAE) and Qatar, to prop up its ailing economy. According to the IMF, Gulf monarchies deposited an estimated $2.5 billion into the Central Bank of Sudan in 2015-16. [fn]"Sudan: Staff Report for the 2017 Article IV Consultation--Debt Sustainability", IMF Country Report No. 17/364, 13 November 2017, p. 3.Hide Footnote This was, in part, a payment for Khartoum's 2014 decision to break off relations with Tehran and committing thousands of Sudanese forces to the Saudi-led war against the Huthis in Yemen. In return, Riyadh also lobbied the U.S. for the repeal of economic sanctions. Despite pressure from Riyadh and Abu Dhabi, and unlike some other African governments, Sudan has not picked a side in the Gulf dispute, preferring maintain good relations across the board. That said, despite its nominally neutrality, Sudan is ideologically closer to the more Islamist-leaning administrations in Qatar and its main ally, Turkey. Though Khartoum has maintained cordial ties to Saudi Arabia and UAE (and retains troops in Yemen), financial assistance from those two powers has mostly dried up at a critical moment, in part, perhaps, because they view Khartoum as insufficiently loyal but also because they see investment in Sudan as risky. [fn]Crisis Group interviews, Emirati government figures and think-tank officials, Abu Dhabi, July 2018. Officials say they appreciate Sudan's assistance in Yemen, where Sudanese troops are deployed in some of the most dangerous front lines, but find Bashir erratic and that his precise loyalties are unclear.Hide Footnote This has contributed to the vulnerable position in which President Bashir now finds himself. President Bashir has shown himself capable of weathering popular unrest in the past. This time around, however, he has fewer options to placate demonstrators and is widely seen, including by many within his own ruling party, as part of the country's malaise rather than an antidote to it. Even so, the critical questions at this juncture are whether protests calling for Bashir's resignation will gather force and, if so, whether this will change the calculations of the security forces and elites who still support him. Three different scenarios could unfold. The first, and seemingly most probable, is that the security services step up repression to disperse protesters, deter future demonstrations and crack down on the unions and associations organising them. As in the past, such a campaign could see protests dwindle without any immediate threat to Bashir's hold on power. This would ensure Bashir's short-term survival, but greater repression risks backfiring and prompting more public outrage. A crackdown would likely slow, if not halt, Sudan's improving relations with Western powers and lifting of U.S. sanctions, thus blocking its path to debt relief or a World Bank or IMF bailout and leaving the government no good option to improve economic conditions. Bashir would simply store up more problems for the future, when unaddressed grievances could potentially trigger even greater protest. In this scenario, countries that remain friendly to Khartoum will almost certainly be unwilling or unable to provide the funds necessary to reverse the economic slide. Bashir may look to the Gulf, as he has in the past. But while Gulf leaders on both sides of the 2017 intra-Gulf spat (Saudi Arabia and the UAE, on one side, and Qatar on the other) can be described as allies and Riyadh and Abu Dhabi in particular want Sudanese troops to remain in Yemen, they will probably not provide game-changing support. [fn]Ibid.Hide Footnote An injection of cash from the Gulf - most likely from Qatar - might, in other words, buy Bashir time but would not address the country's underlying economic challenges. While Turkey and Russia, both relatively new players in Khartoum, have growing business and diplomatic interests in the country, those interests are not sufficiently large or important to motivate a more serious, direct investment in the government. [fn]Crisis Group interview, Turkish diplomat, Khartoum, February 2018. The Bashir administration has sought to deepen ties with Russia in recent years although it is unclear if Moscow deems these budding relations sufficiently significant for them to invest directly in the government's survival. President Bashir visited Moscow in July 2018 and urged the Russians to broaden their engagement with Sudan in the face of what he described as Western hostility. He also travelled to Syria, a key ally of Russia, with Moscow's apparent encouragement, in the third week of December. The head of Sudan's defence subcommittee said 13 January that a draft agreement had been signed that could pave the way for Russia to build a military base on Sudanese territory. "Sudan says Russia could set up military base in Red Sea", Sudan Tribune, 13 January 2019.Hide Footnote China's involvement in Sudan, traditionally focused on developing the oil industry, has diminished since the south's secession. A second scenario might involve the president's removal by elements within his own security forces, particularly if protests continue to spread and Bashir still refuses to step down. This scenario might arise if protests grow in force, the economic crisis deepens and the situation threatens the survival of not only Bashir but also other top officials. Still, given Bashir's repeated reshuffles of leadership positions in the security agencies, such a scenario could provoke infighting among security factions to determine the succession of leadership. Bashir reportedly trusts his intelligence services, key members of which hail from his own riverine ethnic group, more than he does the army, which recruits from a wider pool and whose loyalty is more ambiguous. Salah Gosh, the National Intelligence and Security Services (NISS) chief, now seen as the second most powerful man in the country, was accused of coup-plotting in 2012, and spent six months in prison. Though his statement received wide attention and seemed an implicit criticism of the government, he has shown no sign of acting against Bashir. [fn]Sudan has sent thousands of RSF fighters to fight with the Saudi-led alliance in Yemen. Recent reports suggest that RSF soldiers are deployed in the most bitterly contested front lines and taken substantial casualties, breeding discontent. Crisis Group phone interview, Sudan analyst, December 2018; "On the front line of the Saudi war in Yemen: Child soldiers from Darfur", New York Times, 28 December 2018.Hide Footnote In any case, while the RSF are a major element of the security architecture, they remain mobile and relatively lightly armed, accustomed to counterinsurgency campaigns in Darfur. Those forces are not strong enough to take on the Sudanese army, assuming it remains loyal to Bashir. A third and optimal scenario would see the president resigning or pledging not to contest the 2020 election, with the encouragement and pressure of allies within the ruling party or security agencies and foreign governments. Bashir's decision to seek another term had already divided the NCP and provoked some consternation within elements of the security services; this latest wave of protests has left him further weakened. [fn]Crisis Group telephone interview, Sudan analyst, December 2018.Hide Footnote Dissenters within the party, or those sidelined by the president, view him and his style of government - decision-making concentrated in the presidential palace and a small circle of advisors, with technocratic ministers marginalised - as a liability. [fn]Crisis Group interview, former senior Sudanese government official, Khartoum, June 2018. The official said he was fed up with Bashir's heavy-handed rule. He said Bashir made all key decisions and was mercurial and erratic, rendering it impossible to conduct government business in a professional manner.Hide Footnote A negotiated transition, in which Bashir himself agreed to hand over power to a new government, potentially including moderate NCP and military figures, would be the best way out of the crisis. It could set the country on a path to receiving emergency aid and undertaking necessary reforms to end repeated cycles of conflict. The odds of Bashir taking this route also appear slim. Nothing in his track record suggests he will give up power easily; the recent moves to amend the constitution and remove term limits suggest he already is manoeuvring to retain power beyond 2020. Moreover, he has strong incentives to hold on. Out of power, he would likely fear for his safety, whether at home or living in asylum in a friendly country. He could orchestrate a handover to a loyal general, but he and his family would still risk facing accountability for corruption or other crimes. His ICC indictment for genocide, crimes against humanity and war crimes in Darfur narrows his options for seeking refuge abroad. Those Gulf countries that would be his most probable hosts, chiefly Saudi Arabia, are not parties to the Rome Statute. For Western and other outside powers, the immediate priority should be to avert further violence during protests. On 8 January, the Troika - the UK, Norway and the U.S. plus Canada - issued a strong statement demanding that Khartoum undertake political reform and warning that further indiscriminate violence against protesters would have consequences for future re-engagement between Sudan and the West. This was an encouraging first step. These parties should continue to press the Sudanese authorities to exercise restraint, release political prisoners and address the protesters' legitimate demands. The U.S. should explicitly pin further sanctions relief on the government switching to a more measured response toward the protesters. Such a transition would open up the possibility of further re-engagement with the West and international financial institutions and could offer a lifeline to a population battered by the country's economic decline. It might bring also benefits to non-Western powers. Many countries, including Gulf powers, eye Sudan's agricultural potential and see the country as a potential bread basket, but are reluctant to invest given the volatility under Bashir. A fresh direction could improve prospects for investment and provide greater food security for those countries. A Security Council deferral would involve the Council requesting the ICC to put off investigation or prosecution of his case for one year, pursuant to the Rome Statute's Article 16; the deferral could be extended provided Bashir stayed out of Sudanese politics. [fn]Article 16 of the Rome Statute governing the ICC specifies that the Security Council can pass a resolution under Chapter VII of the UN Charter to defer an investigation or prosecution for twelve months and can also choose to renew the deferral through the same process. See "Rome Statute of the International Criminal Court", International Criminal Court, 17 July 1998.Hide Footnote There would clearly be enormous downsides to doing so - for justice in Sudan and potentially for the ICC itself. The Council would have to insist on some alternative form of accountability for atrocities in Darfur. [fn]In 2012, Crisis Group suggested that the UN Security Council engage with the African Union and the Arab League to strengthen domestic legal institutions' capacity to act against atrocity crimes and so make ICC intervention less necessary under the complementarity principle. In three decades at the helm in Sudan, President Omar al-Bashir has survived Khartoum's internecine politics, repeated wars in Sudan's peripheries, his country splitting in two after South Sudan's secession, indictment by the ICC and frequently hostile neighbours in a particularly rough neighbourhood. He has held on despite repeated predictions of his demise; indeed, his political manoeuvres in Khartoum over the past few years have done much to shield him from potential contenders. Vesting too much hope in the president stepping down any time soon would fly in the face of this record. Are Khartoum and Ethiopia Backing Eritrea Armed Groups?